The U.S. Army Corps of Engineers has been an invaluable partner since CJL's incorporation in 2009 and even earlier when we were just getting started with cleanups of the lake's shoreline. The Corps has helped us to manage effectively those 1,300 volunteers who have removed 4,800 bags of trash (that's about 48 tons!) and 2,300 tires from the shoreline in 18 events so far. The Corps has hosted several of our events at its Visitor Assistance Center near the B. Everett Jordan Dam. Corps staff have been faithful volunteers at our events. 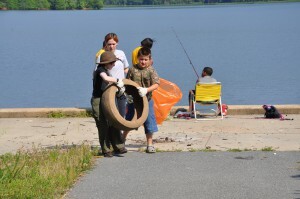 The Corps boats have been used to ferry volunteers and trash to and from remote cleanup sites and the Corps has paid for the recycling of 2,300 tires. This past summer, CJL became a participant in the Corps' Junior Ranger Program organized by Stephen Harrison, Student Trainee Natural Resource Specialist with the Corps. Each summer, kids come to the Jordan Dam Visitor Assistance Center for a half-day week long camp that includes talks and field trips about wildlife habitats. CJL was invited to talk about the threat that trash imposes on wildlife and on natural beauty of the shoreline. After the talk, the kids had their own chance to clean up the shoreline and they did this with great enthusiasm. Some of the trash collected was made into trash art. On September 12, CJL entered into a Cooperative Agreement with the Corps' Wilmington District. Colonel Steven Baker, the District Commander and Fran DiGiano, President of CJL signed the agreement. Colonel Baker also presented Fran with a Certificate of Appreciation as a founding member of CJL promoting numerous corporate lake clean up events. The cooperative agreement provides CJL with more ways to assist the Corps in conduct of its natural resource management and public education programs and more generally, in the advancement of the Corps' work at Jordan Lake. 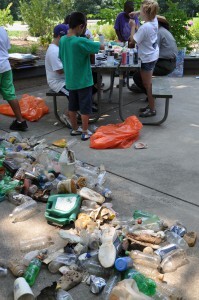 CJL expects not only to intensify its trash removal programs but also to promote litter prevention and recycling in the eight counties with watersheds that carry litter into the lake with every rainfall event. Litter that gets trapped in the coves and little inlets along the shoreline makes its way upwards from the normal lake level to the high water mark after heavy rainfalls. It is destroying natural habitats, recreational opportunities and the beauty of the lake's shoreline.